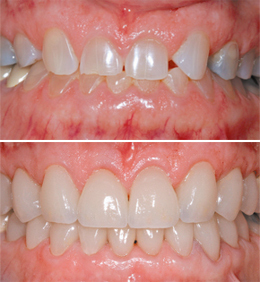 Dental crowns and porcelain veneers can significantly improve crooked, crowded, chipped and gappy smiles. Veneers are usually made of porcelain, while crowns may be made as all metal, porcelain fused to metal or all-ceramic (porcelain). We are directly involved in the design process when improving your smile with dental veneers or crowns, thus ensuring total satisfaction with the end result. We have an onsite dental technician who works as part of our team to ensure you get the very best possible smile. Several samples of this work can be viewed on our before and after photo gallery. Crowns may be placed for several reasons. Usually the tooth has been broken or severely damaged by decay. As a result, a filling can’t replace enough of the tooth or make the tooth strong enough. A crown may hold together parts of a cracked tooth. It also can be used to hold a bridge in place. Crowns can be used to improve appearance as well. They may be placed to cover mis-shapen or badly discoloured teeth. Crowns can be all metal, porcelain fused to metal (PFM), or all ceramic. Metals include gold alloy, other alloys (palladium) or a base-metal alloy (nickel or chromium). The all-metal or PFM crowns are stronger and are better choices for back teeth than ceramic crowns. PFM and all-ceramic crowns are the same colour as your natural teeth. They look just like normal teeth. Crowns usually last at least seven years. In many cases they last much longer, up to 40 years or so. Before placing a crown, your dentist may need to build up a foundation to support it. A foundation is needed if large areas of the tooth are decayed, damaged or missing. If you are receiving the crown after root canal treatment, your dentist may insert a post-and-core foundation. To place a crown, your dentist will file down the tooth to make room for the crown. 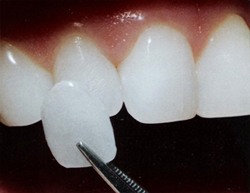 After filing down the tooth, there are two ways to make a permanent crown. Most crowns require two visits to the dentist. You receive a temporary crown at the first visit and wear it while your permanent crown is made. With the traditional approach to making a crown, your dentist first will use a piece of thread or cord to push the gum away from the tooth. Then the dentist will make an impression (copy) of the tooth using a rubber-like material. The impression material sets in about five minutes. Then it is removed. The impressions are sent to the lab, where the crown is made. During that time, you will have a temporary crown placed. At a second visit, your dentist will remove the temporary crown and test the permanent one.